The gladiola flowers have been putting on quite a show this year. Pink, white, red, greenish-yellow, and purple gladiolus have graced my garden. I really like gladiolas but whenever there is a heavy rain or higher-than-usual winds, the glads dip over or break off. If you have a lot of gladiolus bulbs, plant them together rather tightly up against a structure like a fence, trellis, or even an art piece in your garden that can act as a support. When you plant them in a cluster, you can tie them all off to the same structure, making it less time consumptive to stake them with a support. If you plant your bulbs in a more clustered formation (2 to 3 inches apart rather than the recommended spacing), your plants will require more nutrients and water to thrive than when planted with normal spacing. You may need to fertilize and water them slightly more often to keep them healthy. 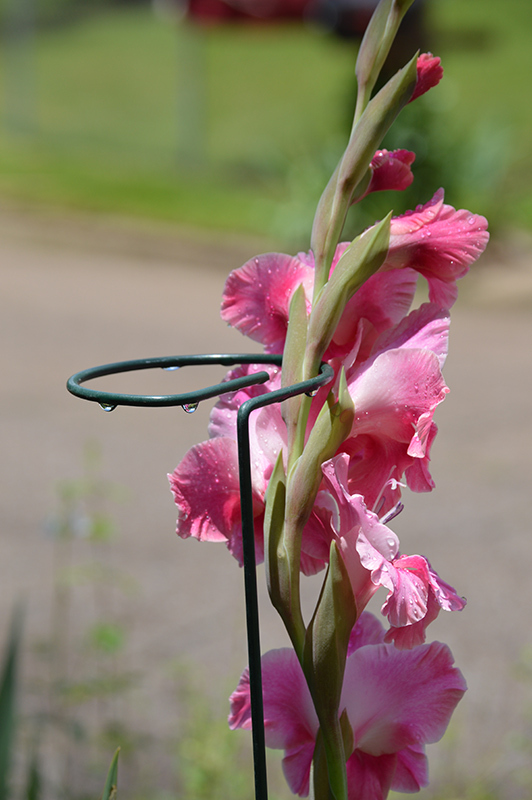 If you use fishing line to tie up your gladiola flowers, it won’t be visible to most passersby. You can also use garden twine (which is often green or brown) or jute. We don’t use a fluorescent or other brightly colored string or twine because it will really stick out and draw attention away from your garden. Tie up the gladiola flowers closer to the top of the buds, probably right in the middle of the flower buds. My Gladiolus always seem to break right at the base of the buds. The top just gets too heavy for the stem to support it. The benefit of grouping all of your Gladiolus bulbs together and then having a back support to tie them to is that the group of flowers will help support one another, reducing the need for multiple tie-ups. My Gladiolus bulbs are scattered throughout two of my flowerbeds, making using a single support system for multiple flowers impossible. Instead, I have individual stem supports (flower stakes) that I move around my garden as each bud gets ready to bloom. Luckily, the flowers don’t all open at the same time, so I can spread out the use of my 6 flower stakes in the garden. My single stem supports are about 48” inches tall with three circular sections that I thread the plant through for extra support. They are made of a green polyethylene-coated steel. Their coloration helps them to blend in to my garden, making them nearly invisible. I purchased my stem supports from Gardener’s Supply in 2012 and I am still using the original stakes. 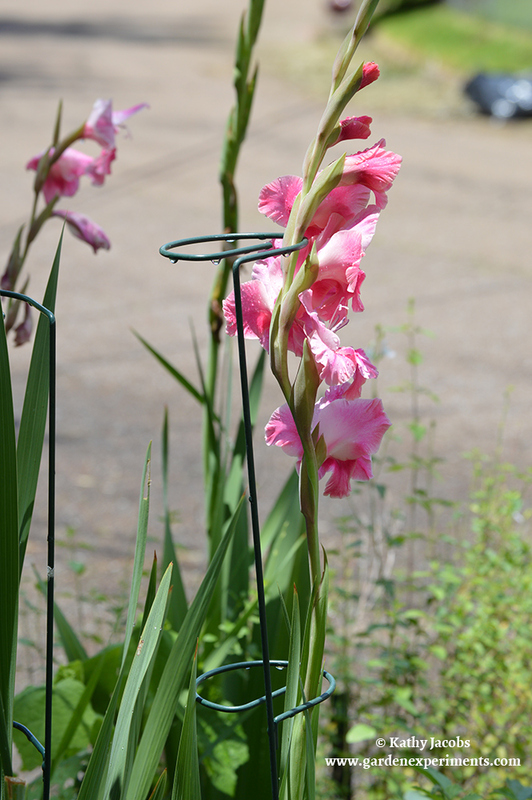 These Gladiolus stakes have a little flexibility in them, so pushing them deep into the soil is a must. This gives them better stability. In a couple of cases, the flowers grew too tall for the supports, but most of the time, the 48″ height of the supports is adequate. The benefit of these polyethylene-coated steel stakes versus homemade wooden or metal ones is that they are very thin, making pushing them into the soil very easy and giving me plenty of space to make sure I don’t strike the bulb or other adjacent plants. My homemade stakes are usually made of rebar or scrap pieces of wood. These are always much thicker than the purchased stem supports and require careful placement and installation in my garden. They usually have to be pushed into the ground with a hammer as well. Since my gladiola flowers aren’t planted near one another, I have to move each support from one plant that has completed blooming to the next one that is budding. Moving my steel flower supports is very simple as they are easy to pull up and then push back into the soil. A thicker support made of rebar or wood would require a little more effort. Another benefit of my stem supports from Gardener’s Supply is that I can take them out and store them for use the following year. Because they are coated in polyethylene, they last a long time and due to their size, they don’t take up a lot of storage space. Don’t give up on planting and enjoying Gladiolus flowers just because they have a tendency to break or bend. 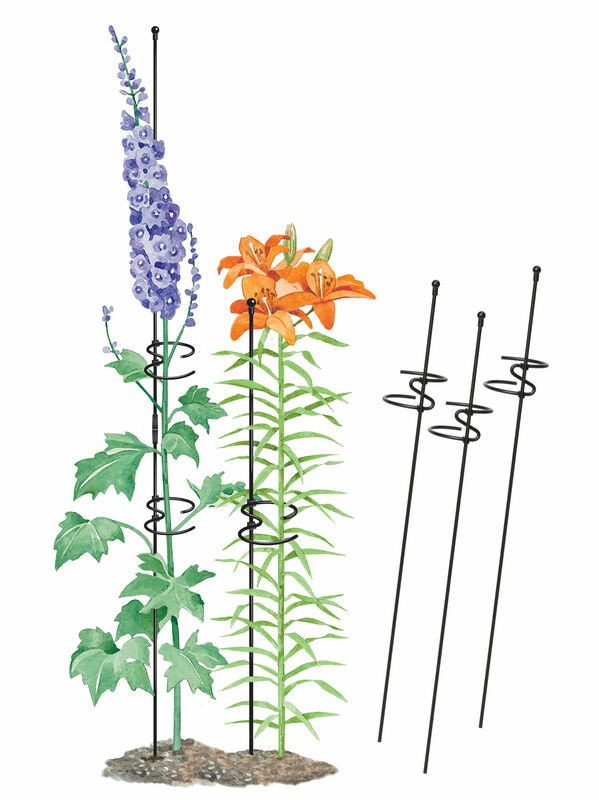 Plan your garden so that you can stake the stems or group them all together for better support. You’ll be so glad you did when the blooming starts! This content includes affiliate links. Read my disclosure for more information.